Sushi Central brings you the ultimate menu of healthy food such as sushi rolls, sashimi, hot dishes and desserts. Sushi Central is an affordable family favourite serving high quality Japanese-inspired cuisine offering dine-in, delivery and supply services in Dubai and Abu Dhabi. Our contemporary sushi and Japanese food dishes are served with a modern twist of fresh and exciting concepts. 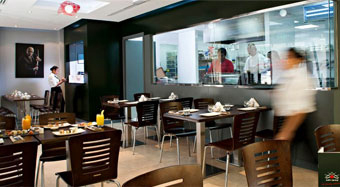 Through our branches and centralized facilities we maintain quality and taste and develop cooking techniques that enable us to reduce selling price overtime. We aim to communicate our values which is to pursue a healthy alternative reinforced by our campaign, “Eat Healthy, Stay Fit”. To get long lasting results, a healthy diet should be coupled with increasing physical activity. This is one of the reasons Sushi Central is committed to partner with various groups in the community to promote a healthier lifestyle. There is no doubt that being active contributes to longevity. “We encourage people in Abu Dhabi, Dubai and the other emirates to engage in physical activities that enhance fitness and to practice an overall healthy regime to improve quality of life”, said Ons S.A. Mebarek, Managing Partner of Sushi Central.